Thanksgiving day is over, but a weekend full of leftovers is ahead! While you’re trying to figure out what to do with all of that leftover turkey, why not learn a little about how that bulky bird was raised? Or, rather, how that bird would have been raised a couple of generations ago. 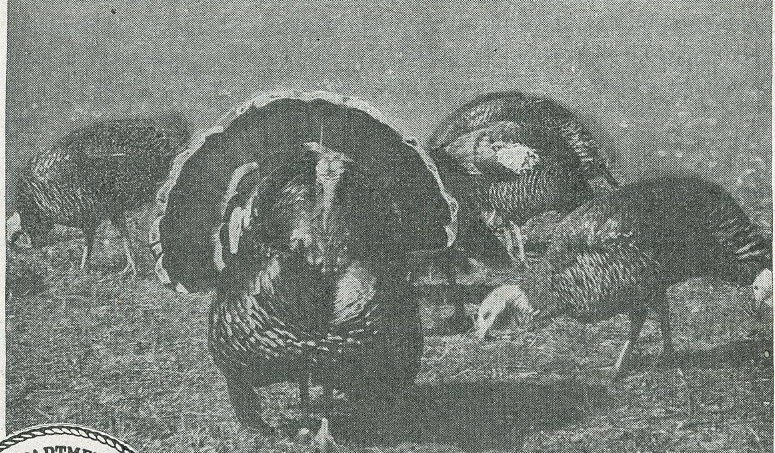 While commercially-produced turkeys today are Broad Breasted Whites, 70 years ago Bronze was the breed (and color) of choice. In fact, my grandfather started out raising Bronze turkeys, but both my father and my brother raise Broad Breasted White. Of course, some smaller operations today raise heritage turkeys, including the White Holland (an ancestor of today’s widely raised Broad Breasted White), Narragansett, and Bourbon Red. Let’s say you want to be an old-fashioned turkey farmer. Well, there are few things you need to know: sanitation and disease prevention, equipment, how to care for baby turkeys, and how to feed them until market age. Sanitation and disease prevention were just as important in the old days as it is today. The USDA Farmer’s Bulletin No. 1409: Turkey Raising, 1940, provides some guidelines and common practices regarding this issue. It was incredibly important that farms had some sort of sanitation system in place. These included making sure the range had clean soil, feeding birds from feeders that couldn’t be contaminated by their droppings, and always keeping the buildings sanitary. When it came to feed, sanitation of containers was especially important when milk was used (yes, turkeys used to be fed milk). Of utmost importance was keeping turkeys separate from chickens and any other poultry – diseases are easily spread from poultry species to poultry species (this includes pet birds)! Swift’s Turkey Feeding and Management Guide, undated but from the pre-Broad Breasted White era, provides some additional guidelines. These include availability of fresh, clean water at all times, cleaning and disinfecting brooder houses before new poults arrive, regular disinfecting of equipment, and not allowing visitors to enter turkey buildings or walk on the range, as diseases are easily spread between flocks. These practices are generally still in place today. Now that you know how to keep your birds healthy, you need to know what equipment is needed. Swift’s Turkey Feeding and Management Guide recommends equipment to be used to raise 1,000 turkeys – a number that pales in comparison to today’s 10,000+ on turkey farms. Poults (the proper term for baby turkeys, not “chicks” like this guide calls them) were commonly raised both in brooder houses – and still are today, although the buildings are much larger – and on the range (outdoors). Equipment suggested in the guide include 4-foot long feeders, so that poults always have access to feed, 3-gallon poult-sized fountains for water, larger 6-foot long feeders for when the turkeys get a little bigger, 4 stoves designed for 500 poults each; these were used to keep the turkeys warm. Stoves are still used today, suspended in the air so they hover above the poults, like a low-hanging, warm roof. Brooder houses at the time were recommended to be 10×12 feet or so, with equal size sun porches for fresh air. For the range, 6-foot long feeders were recommended and 4-foot long watering troughs, rather than fountains. Also needed on range were shelters, fencing to keep turkeys contained, and shade. With all of these set in place, you are now ready to add turkeys to your old-fashioned turkey farm! 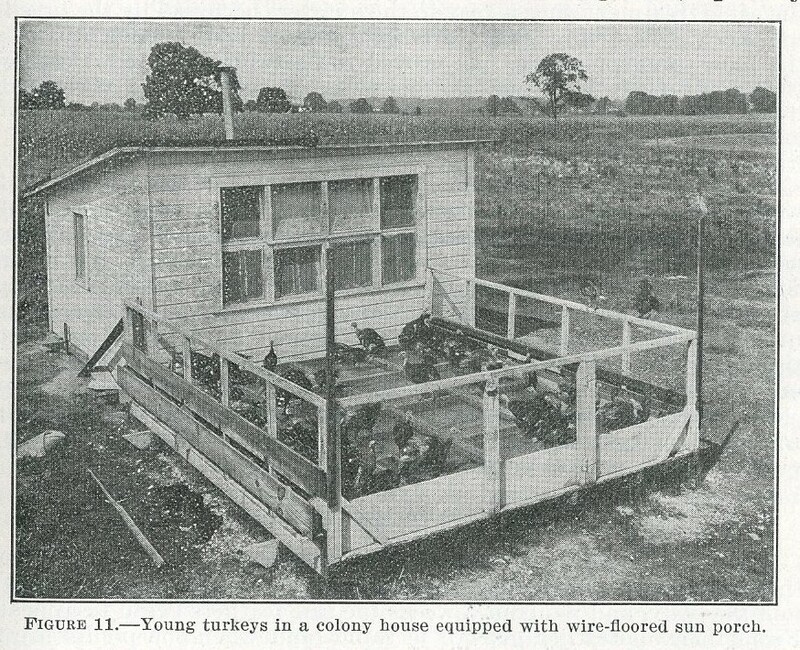 At this point the question is, how do you raise baby turkeys on a 1940s farm? The USDA Farmer’s Bulletin No. 1409: Turkey Raising tells us how to get started. First of all, the litter (stuff that’s put on the ground in turkey buildings) was supposed to be sand or gravel for the first two or three weeks, and then switched over to straw or hay. Today, sawdust is used throughout the turkeys’ lifespans. Knowing when to start feeding your poults is also important on your 1940s turkey farm, since they have probably hatched on your farm. 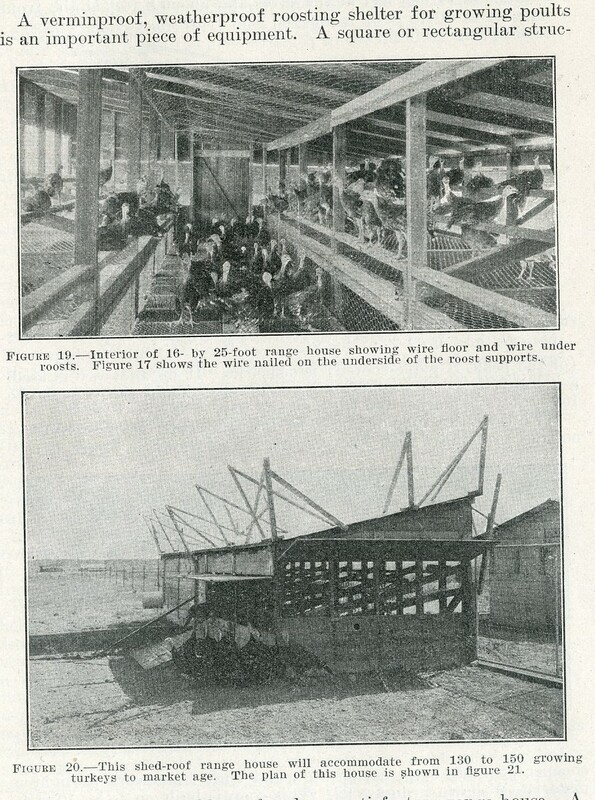 In 1940, leaving poults in a darkened incubator for 12-24 hours and feeding them as soon as they were moved to the brooder house was becoming the general practice. It also thought to be better than waiting for up to 72 hours, which was sometimes done. I know you’re thinking, “Great, but when it comes time to feed them, what do I actually feed them?” Let’s take a look, shall we? The USDA Farmer’s Bulletin No. 1409: Turkey Raising comes to the rescue again, providing guidelines and recipes on feeding your turkeys. 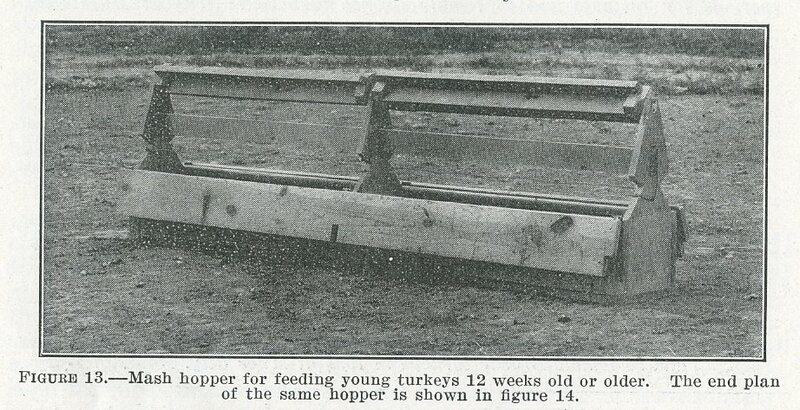 First and foremost, feed was to be available to turkeys at all times, from hatching to market. The first feed poults were given was to be made up of green feed (finely chopped, tender) and dry starting mash (recipes to follow). Ground or crumbled hard-boiled eggs could be added to the mixture, and milk – “if not too high priced” – could be kept in front of them in easily cleaned containers, such as crockery, tin, wooden or granite. After those six to eight weeks, up until market, the feed changed. It could included mash and whole grain or liquid milk and whole grain supplemented with insects and green feed. However, it was better to supply sufficient protein and minerals in the mash, as that would help with regular growth. The USDA guide provides four different growing mash recipes, but the main differences from the starting mash listed above include the omission of cod-liver oil, different amounts of each ingredient, and in some cases the addition of steamed bonemeal and ground oystershell or limestone. With all this information (and much more thorough research conducted by yourself), you should be ready to run your own 1940s-era turkey farm! Or, maybe you just know a bit more about the history of turkey farming. That’s fine too. For more information on raising turkeys and other poultry-related information – including how turkeys were prepared for market and how they were selected for breeding, see the Iowa Poultry Association Records, MS 67. We also have a book on the farm struggles of one man in the 1930s, including entries on turkey farming: Years of Struggle: The Farm Diary of Elmer G. Powers. Want to know how your turkey is raised today? Read this blog post (full disclosure: written by my sister-in-law) that provides a farmer’s perspective. The Iowa Turkey Federation is also a great resource – plus, they have lots of turkey recipes on their website, in case you haven’t figured out how to deal with all those leftovers yet. It’s that time of year again! Time for turkey, stuffing, pumpkin pie, and everything else that goes with Thanksgiving. This, of course, includes time spent with family and friends. 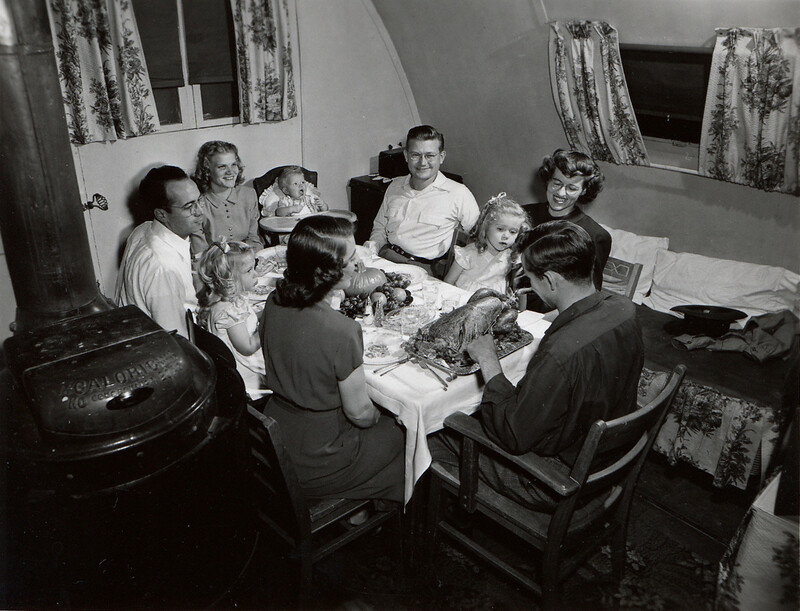 To celebrate, here’s a 1948 photo of friends coming together with their families to share a Thanksgiving meal in Pammel Court, often referred to as “married student housing.” Today, this area is the location of office buildings and our Library Storage Building. For the photo above and more, check out our Flickr page! Information about Pammel Court and other residence halls can be found in Department of Residence records, RS 7/4. If you’re looking for some new (or rather, old) recipes to try this Thanksgiving, take a look at our Iowa Cookbook Collection, a few cookbooks of which are digitized. Whatever you’re eating this year – whether it be Spiced Cranberry Stuffing or various iterations of corn – and wherever you are eating – at home or in front of a computer, reading a history of Pammel Court – the Special Collections Department wishes you a safe and happy Thanksgiving! Since we already have several blog posts related to Thanksgiving items here in the Special Collections Department (available here and here), I had not intended to create a Thanksgiving blog post for this year. However, I recently received a call from Iowa Public Radio asking me if I would like to speak on the Iowa Public Radio program Talk of Iowa. I was one of three guests on the program last Wednesday morning, and I spoke about some items in our collections which are related to Thanksgiving. I enjoyed being a part of the conversation, even though the hour’s program was far too short to share all of the recipes I had put together to speak about! Did you enjoy last Thursday’s Thanksgiving meal? Are you all ready to start planning for next year’s Thanksgiving? If so, this is the post for you! If not, hopefully you will find some of the recipes below interesting, and perhaps they will inspire you to remember them when planning for the 2013 Thanksgiving meal next fall. Or you may even find a delightful holiday recipe to add some historical cuisine to your menu (holiday or otherwise)! What better introduction do we need to inspire us to create healthy recipes together in the kitchen? The section under meats contains a chapter on “Nuts as a Substitute for Meat.” The introduction to this chapter states that since the “soaring cost” of meat, many had been rationing or eliminating their use of meat. However, as the chapter notes, nuts “contain more food value to the pound than almost any other food product known” and goes on to explain that peanuts have a significant amount of protein. Interested in making a Nut Turkey (page 68) instead of the traditional turkey for Thanksgiving? Below is the recipe from this interesting book – I recommend you take a look at it! As the note found at the beginning of the cookbook states, the book includes notes and check marks made by Carrie Chapman Catt. If you are not interested in the Nut Turkey, then peruse the digital version, and perhaps make a favorite of Catt’s instead! Another interesting cookbook which contains a turkey recipe (and this one for the actual bird!) is Mrs. Welch’s Cookbook. Mary Welch was the wife of Iowa State’s first president, Adonijah Welch. Mary Welch had many accomplishments in her own right, including helping start and acting as the first head the Department of Domestic Economy (now better known as Home Economics or Family and Consumer Sciences). In addition to the recipes, the cookbook also contains explanations and experiments for learning the why of cooking. For instance, the section on Soups, Meats, Poultry and Game tells the reader to thinly cut a piece of meat and then wash and boil it. She explains the changes that are taking place to the meat, and why. The recipes sometimes also contain references to this experiment at the beginning of the chapter in order to provide brief lessons within the recipe itself. Wondering how March Welch recommends making a turkey? You can find the recipe online here on page 178-180. Trying to figure out what to do with your turkey leftovers? A recipe for turkey soup can be found here on page 154. Interested in learning more about Mary Welch or Carrie Chapman Catt? The University Archives also holds the papers of both. The finding aid for the Mary B. (Mary Beaumont) Welch Papers can be found here, and the finding aid for the Carrie Chapman Catt Papers can be found here. Formation for 1935 4-H Girls Convention at Iowa State College (University). Thanksgiving is now less than a week away! What might we have here in the Special Collections Department related to Thanksgiving? Actually, quite a lot if you are creative about it. You could search our website to find out all the places where Thanksgiving appears in our finding aids, or pick out a diary or two and see if the writer described Thanksgiving activities. This post, however, will highlight just one of our rare books from the TX809 call number area (which encompasses books dealing with the cooking of cereals/grains…if the photograph above has not given it away, you’ll have to read more to find out which grain this post will discuss!). One title which caught my eye as I scanned the TX section for possible cookbooks related to Thanksgiving was “Indian Corn as Human Food” by Mary S. Scott. The story of how the Native Americans taught the Pilgrims how to grow corn for food, and was very likely served at that first Thanksgiving, helped justify taking the book off the shelf for a Thanksgiving related post. The book, published in 1889 in Nevada, Iowa contains an interesting selection of recipes and descriptions about corn by an Iowa woman at the end of the 19th century. Corn was then, as it is now, an important Iowa crop. Although we may not agree with everything she writes and the views she has, the book is still an interesting read. A biography of Mary Sophia Scott can be found here (the book, American Women: Fifteen Hundred Biographies with over 1,400 Portraits…, can be found in the library’s reference section under call number CT3260 .W66a). And another one of her reasons for writing the book was “…there is possibility of danger that some of the customs of the early days that are worth preservation may become obsolete;-and, among others, the making of the very best foods from Indian corn may finally be numbered among the Lost Arts.” (page 29). Hopefully Mrs. Scott would be happy to know that a copy of her book is housed down the road from her hometown of Nevada here in Iowa State’s Special Collections Department! If you would like to keep some these “customs of the early days” alive, please feel free to come to our department and take a look at this little book! Included are recipes for a variety of corn breads, brown breads, muffins, hominy, puddings and other dishes made from corn. There are even instructions for how to make corn ginger bread, ash bread (cooked in the hearth covered with ashes!) and how to hull corn with potash or wood ash. If you would like to find out other items we might have related to corn here in the Special Collections Department I encourage you to peruse our website…and narrow down what you are looking for…we have quite a lot of collections and rare books related to corn since it is, and has been, an important research area here at Iowa State for many, many years! A good place to start might be our subject guide on agricultural collections. A corn train in 1905. Iowa State Professor Perry G. Holden established the “corn gospel trains” in 1904 which taught farmers how to select and test seed corn throughout the state. More on the corn trains can be found here and in the Perry G. Holden Papers (link to finding aid). Did the owner of this book attend the Thanksgiving football game? Or did they tuck the tickets away in the cookbook before the game, only to come across them later? Perhaps impossible to answer, these bits of ephemera sometimes contained in our rare books, holding their own secret history, are fun to come across and wonder about! Interested in more about Thanksgiving related items and collections in the Special Collections Department? Last year’s Thanksgiving post was about recipes from a WOI homemaker’s show, The Homemaker’s Half Hour (scripts from this show can be found in the WOI Radio and Television Records, and throughout a variety of other collections). For more on the history of Thanksgiving from our National Archives, you can go here to see various government documents which created Thanksgiving!